Developer Subset Games today released its popular real-time strategy game FTL: Faster Than Light on the iPad, coming roughly a year after the title was released on Mac, PC, and Linux to much acclaim. The game puts the player in the commanding role of a ship aligned with the Galactic Federation, tasked with getting vital data back to its headquarters. However, rebel ships are persistent in attacking the spacecraft, allowing players to engage in top down combat while maintaining and upgrading their ship with new weapons, crew members, and more. The award winning PC spaceship simulation game from Subset Games comes to iPad! - Permadeath means when you die, there’s no coming back. The constant threat of defeat adds importance and tension to every action. 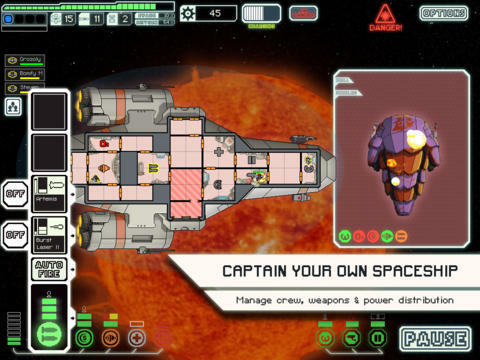 The iPad version of the game also includes the FTL: Advanced Edition expansion, which offers new ship systems, events, weapons, drones, equipment, enemy types, levels and more in addition to user interface improvements. Our sister site TouchArcade reviewed the game, regarding the iPad version of FTL as the “definitive version”, crediting the title's touch controls and regarding them as more intuitive compared to a traditional mouse and keyboard control scheme. Overall, the title was noted as the perfect “play while you do something else game” and given a five star rating. The full review is well worth checking out, as is a video walkthrough of FTL which can be seen below.